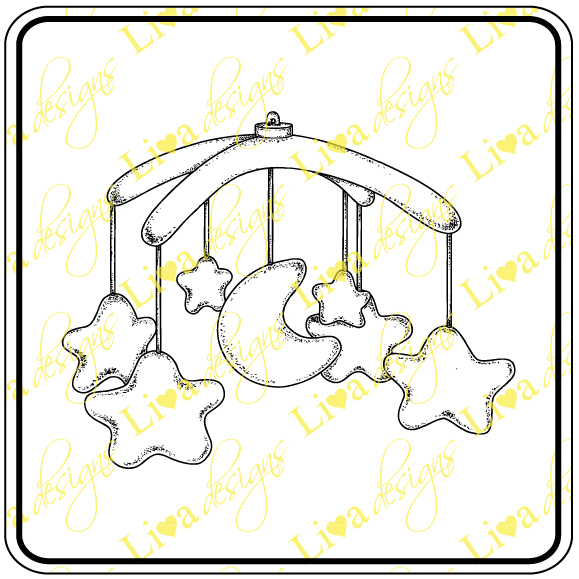 This week the theme for Digi Doodle Shop's Best challenge is open, so I thought to join useful and necessary with lovely and dear :) The useful and necessary part was for my new girls room to have bedside lamps, and the lovely and dear part was to have not any lamps, but especially made and personalized ones. 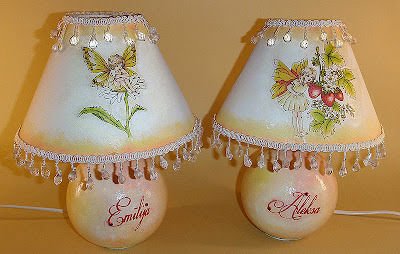 As Aleksa and Emilia's new room is in white and yellow colors with slight touch of pink, lamps were made in the same colors. As my girls are my princesses, there really are no better images than Digi Doodle shop's Fairy & Daisy and Strawberry Fairy ones. 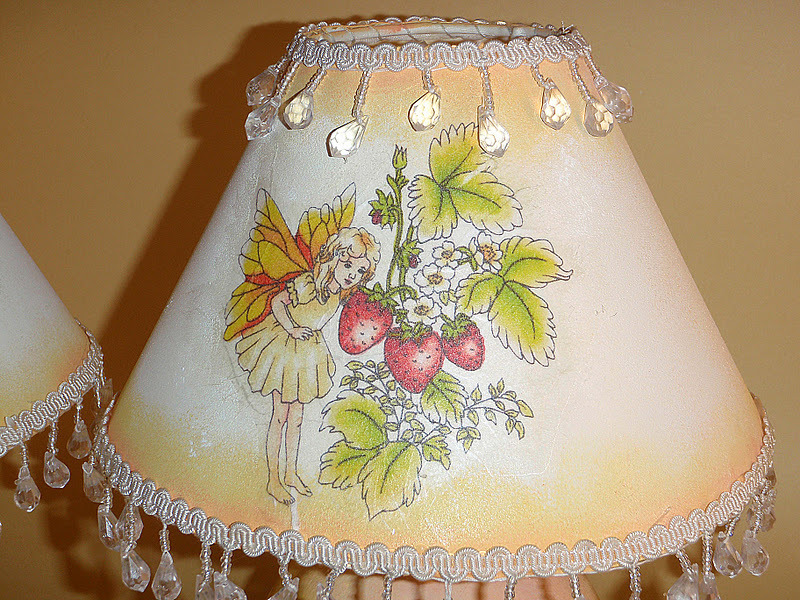 I had these two lamps for my own bedside tables, but as I have changed my room as well, these were no longer needed. 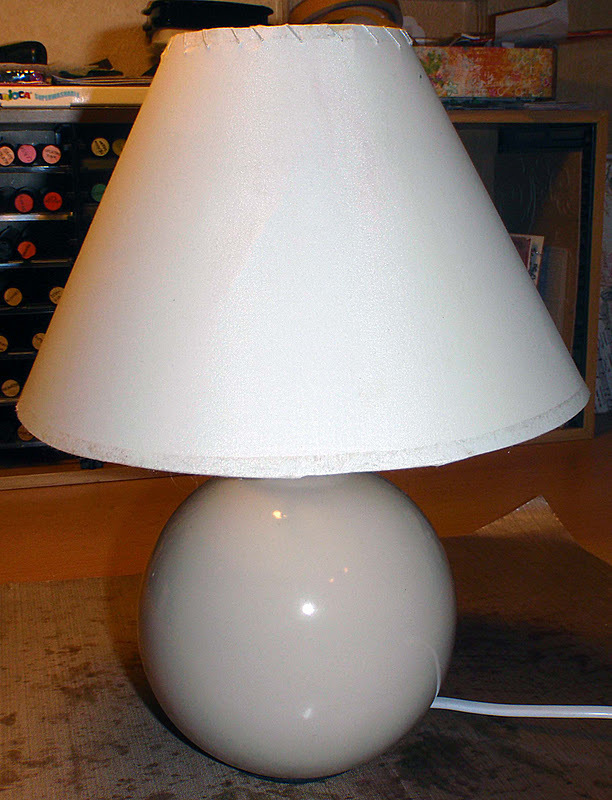 I removed lampshades and light bulbs and covered lamp bases with white decoupage base, to get a better grip for my paints. Then I sponged some yellow, pink, orange and white Stamperia paints. 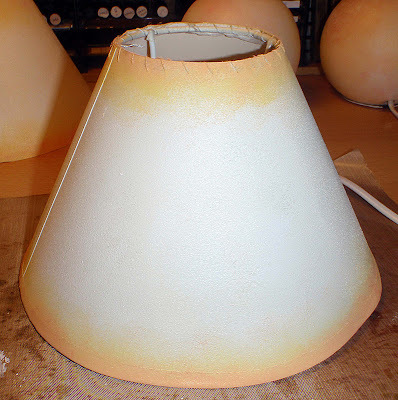 I did the same for my lampshades but left the middle part fairly light so that color wouldn't show through my images. I had printed my images out, colored and scanned back into PC. 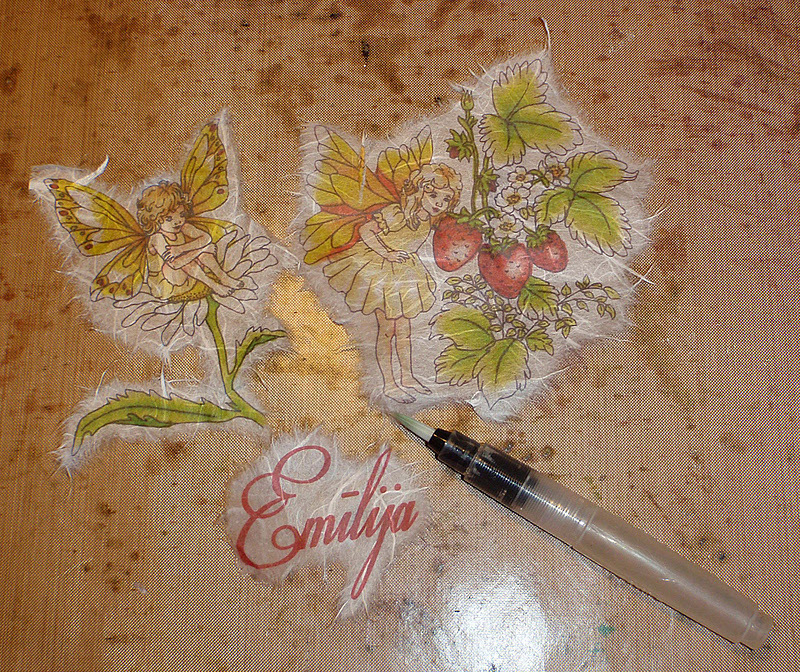 Then I printed them on rice paper. Then using water brush I tiered out my images as well as my girls' names. 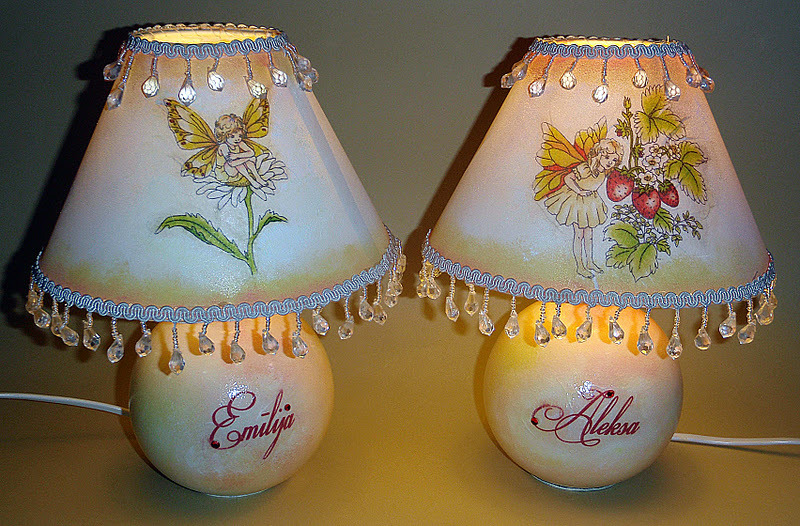 Both images and name goes on each lamp. I adhered my images to lamp shades and using hot glue gun added that lace with dangles. Names were adhered to lamp bases and adorned with few gemstones. 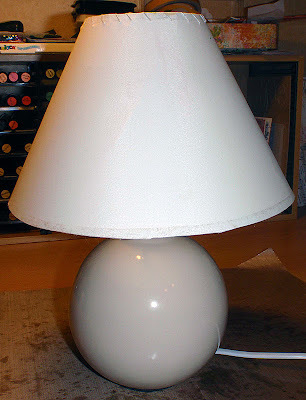 Girls really love their new lamps. This is how they look when turned on. 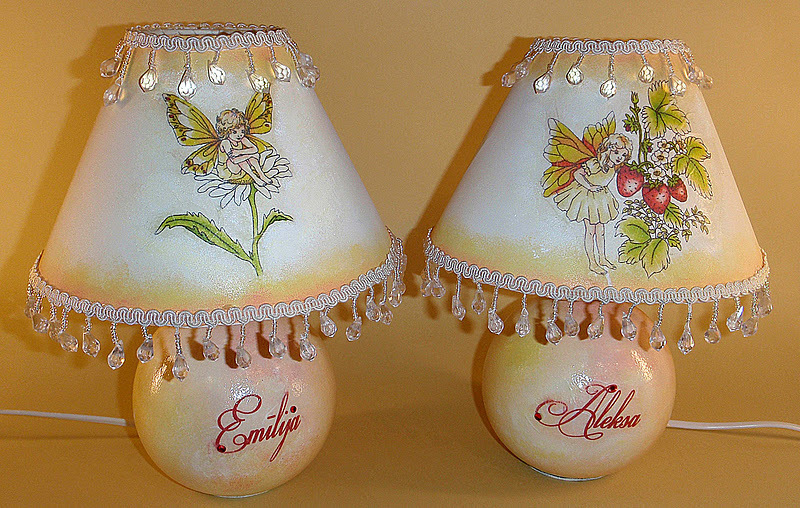 They can turn lampshades around and choose which fairy to be displayed in front. This first one is a baby mobile with stars and moon. I think I will make this into a wonderful baby boy card, as my cousin recently gave birth to son Toms. First I separated that beautiful hibiscus flower (Oh I do hope that it is hibiscus :) on my PC, enlarged it and printed out for coloring. Then I used lots of purple ProMarkers to color it and then scanned it back to my PC. 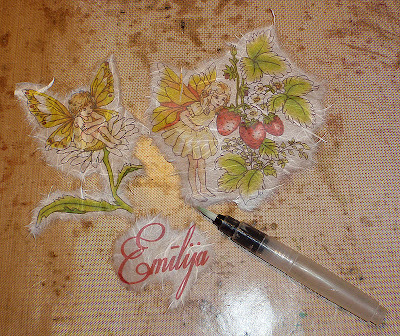 Then I made several patterned papers using this colored image and leaves, which I afterwards printed out again - quite a bit of fuss, but it definitely was worth it. 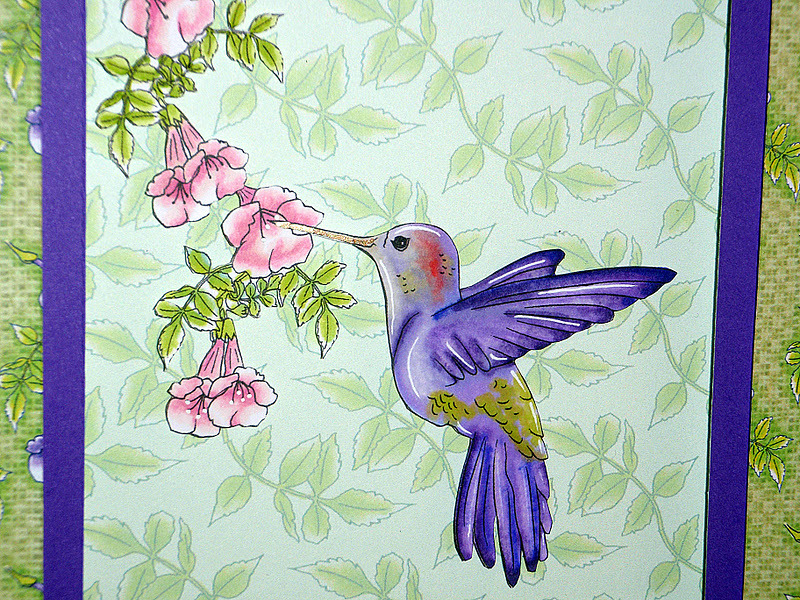 It actually was kind of fun to color this image, because I have never seen a hummingbird in my life :) But I googled some pics of it and made my coloring according to those. 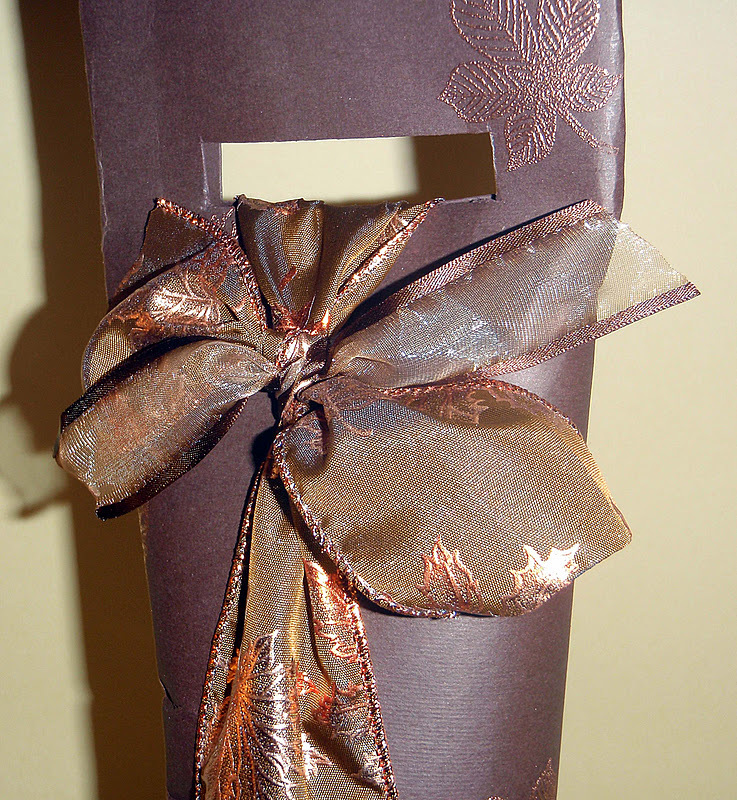 Recently I had to make a gift wrap for a wine bottle. I had never done this before and had not much time either. 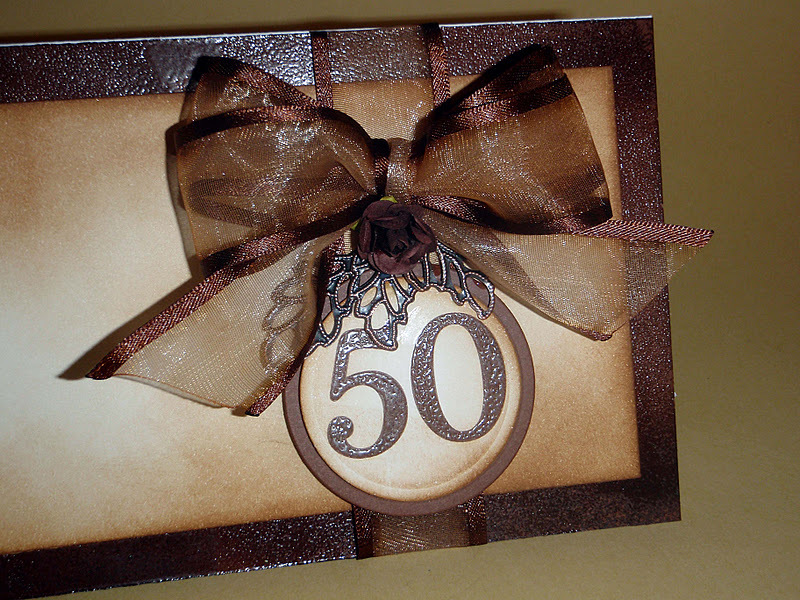 So all I did was to take brown large card and stamp it with leaves stamps and embossing ink. Then I embossed my pattern with copper embossing powder. I wrapped my card around bottle and glued vertical edge with double sided tape. Next I squished top side of paper cylinder and cut rectangle with craft knife. 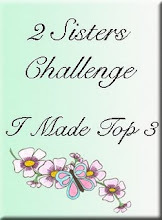 Then I wrapped very wide ribbon with sparkly leaves around my bottle and through my cut rectangle. Only thing left to do, was to tie a knot. I also used leftover from my previously used ribbon to tie it around the first knot. 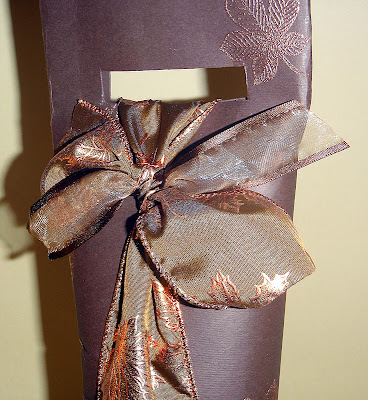 A very fast and easy way to giftwrap a plain bottle - I sure will try to do this some time again. 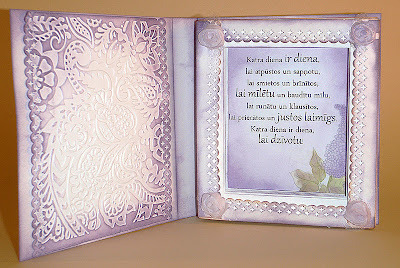 I suppose everyone might agree that it is very hard to make cards for men and not just every men, but the ones that would not find likeable cards with any cartoons or humor. Well I had to make a card for just that kind of a gentleman. My uncle to be exact. He celebrated his 50th birthday this Sunday. He has always been involved with government and parliament, so he always is so very polite, accurate and well... somewhat scary :) But nevertheless, had to figure out a card that would fit him. I went browsing the web for inspirations and found this photo of Victorian gentleman sitting in a chair - he really reminds me of my uncle. 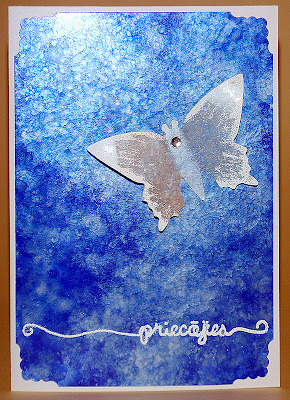 I used brown card as a base for my card, but I wanted some more shine to it, so I clearembossed it with embossing powder. 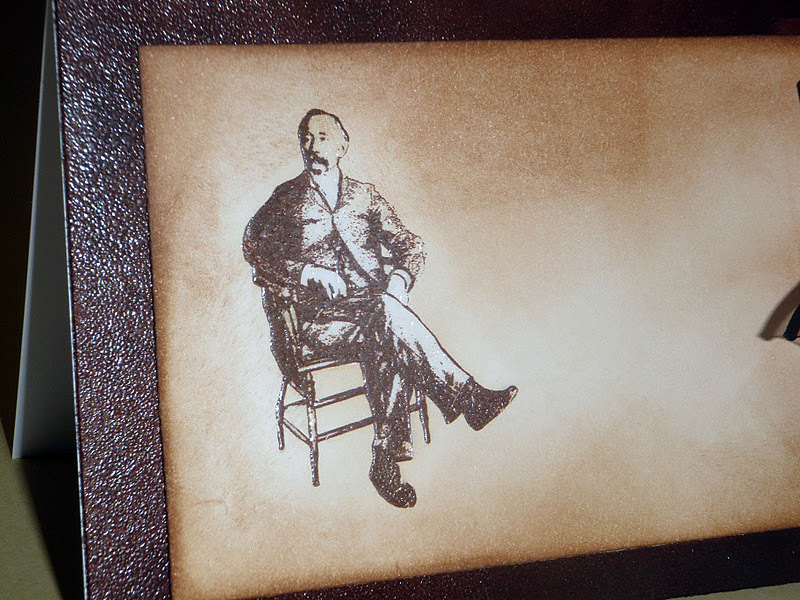 Then I printed my gentleman on a white card and inked with Distress ink. Then I thought that my gentleman looks too plain compared to my card base, so I clearembossed that as well using glue pen to trace over my image. I should say that it would look better, if I had done this before inking my paper, so that there would be more white highlights. 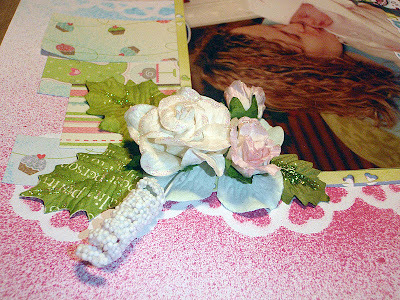 (and by that I mean me, with my love for paper flowers). 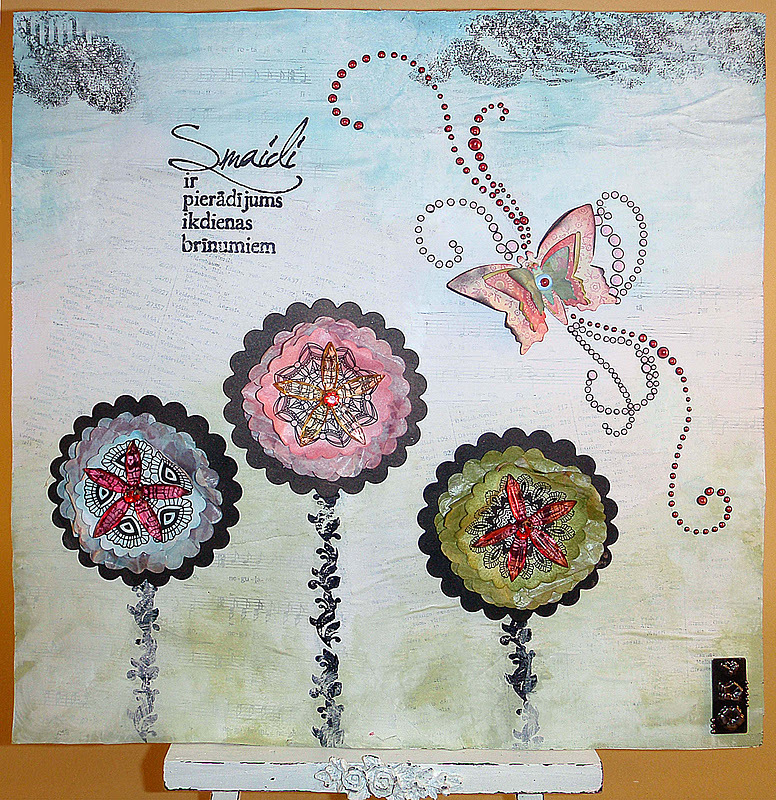 There is a challenge of vintage or Distress colored images in Color Creative Classroom CMC Copic Group and five links to videos of coloring distresslike with Copics by Suzanne J Dean. Of course I have almost none of the mentioned Copics (one to be exact), I tried to substitute them with ProMarkers that I have. I printed out Copic color chart and compared it with my colored ProMarker chart. For skin I substituted: E13 with Sunkissed Pink and E11 with Almond. E00 I actually had :) and additionally W3 with Warm Gray 2 (I don' t have any other grays than twos :) R21 for cheeks was substituted with baby Pink. 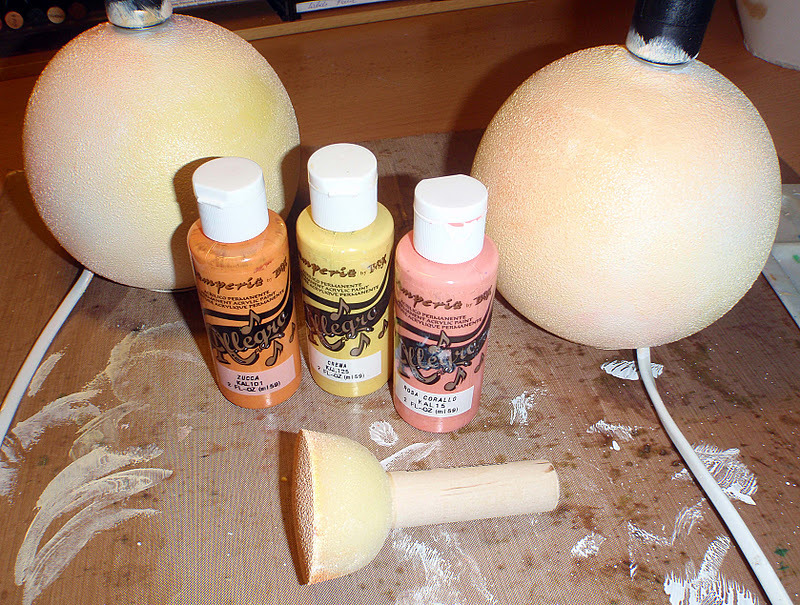 Hair: E27 with burnt Umber, E25 with Cocoa, E31 with Dusky Pink and E41 with Satin. Blues: B95 with Denim Blue, B91 with Pastel blue and additionally I added B000 Copic. Her coat was a mix of markers I have used to color her hair and skin. 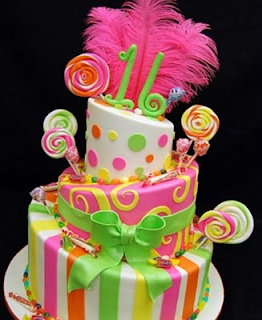 Green leaves were colored with Mint Green and Pastel Beige, but red berries with Pale Pink and Almond. I added Stardust Stickles to her wings, Patina Stickles on leaves and Ruby Sparkles from PSX Designs to berries. I hand cut card shape from white cards and inked its edges with Tea Dye ink. 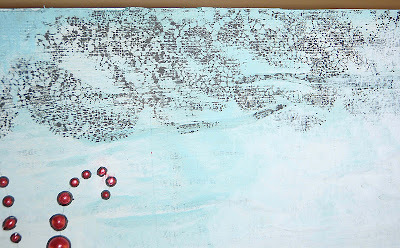 Then I clear embossed some snowflakes on patterned paper with notes and then inked with the same ink as well. 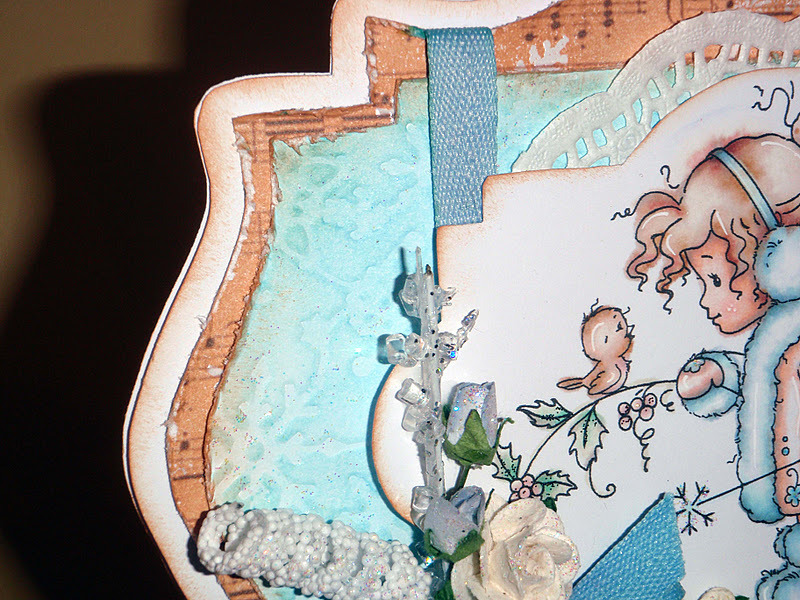 I cut similar shape to the card blank just slightly smaller from that patterned paper. 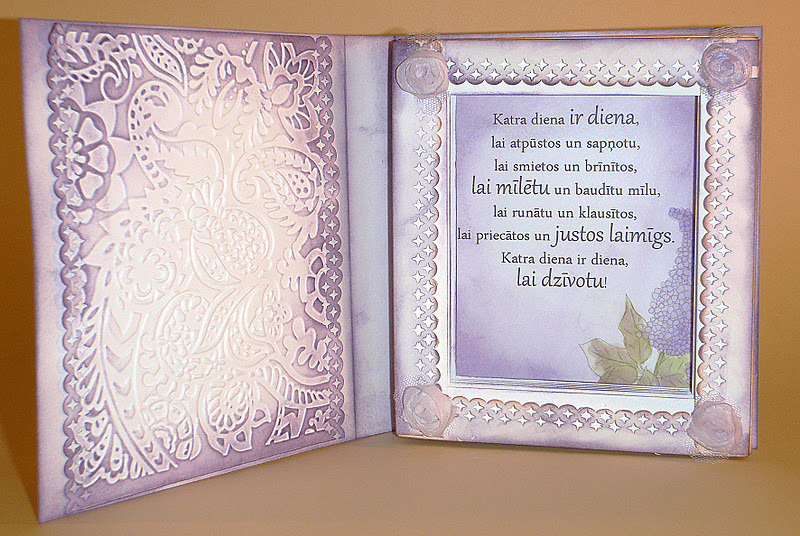 Next, I dry embossed white card with Spellbinders snowflakes embossing plate and inked it with Tumbled Glass ink. 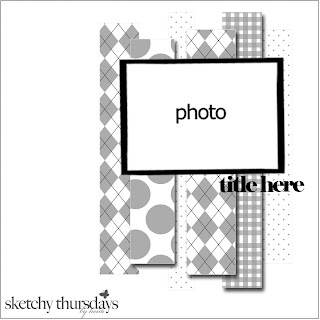 For this shape, I cut of top and bottom parts to get horizontal lines. I distressed both shapes with my self made distressing tool. Lastly I made a cluster from blue seam binding (this one was weird one, because it was very sturdy and when I wanted to scrunch it up, it just went flat again), paper flowers and a small hand cut tag saying Happy Celebration, but one could also translate it as Happy Holidays as well. I started with white page and did some blue inking on the edges. 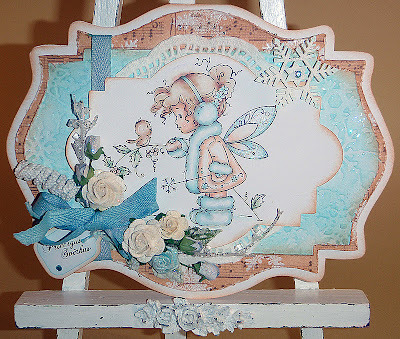 Then I used one of large Woodware border punches to punch frame around my photo and inked it some with green ink. 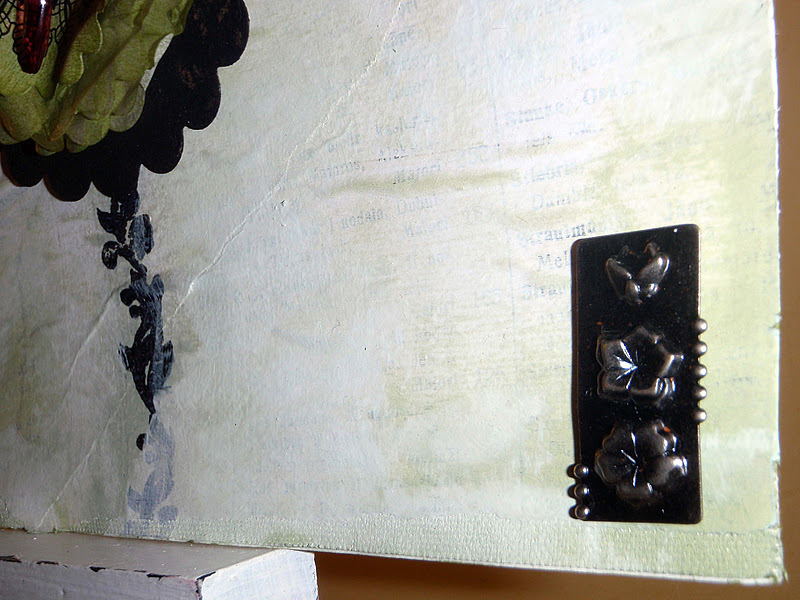 I did not like it so I cut those heart parts away and instead glued them to two sides of my layout. 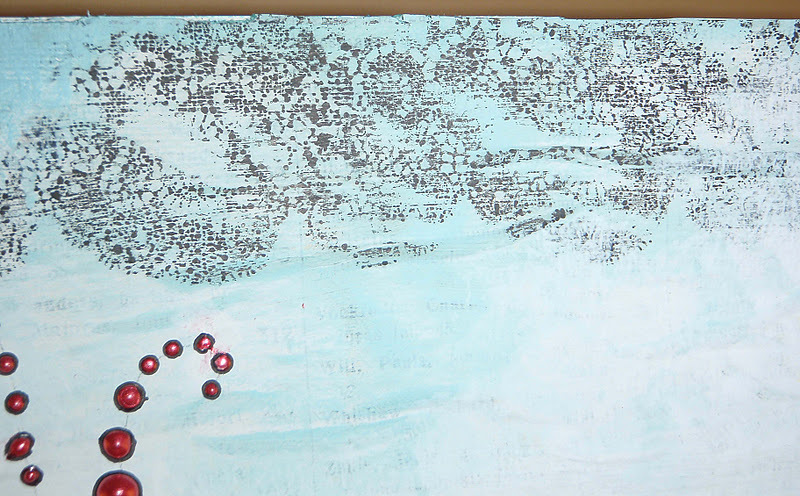 I also punched a strip of heart scallops and misted it with red and blue diluted Color Washes. 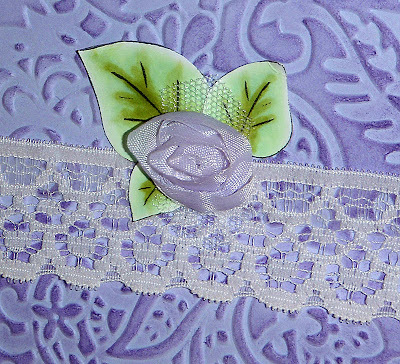 I stamped Ippity Flower Cuppy Cake and colored it with mix of ProMarkers and Copics. 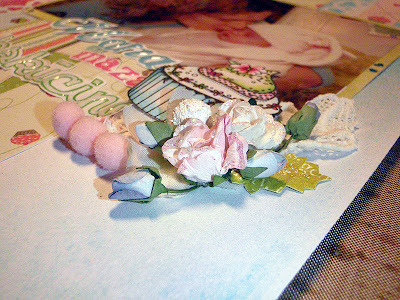 I also added some lace, paper flowers and leaves and pompom trim to cluster around my cup cake cut out. 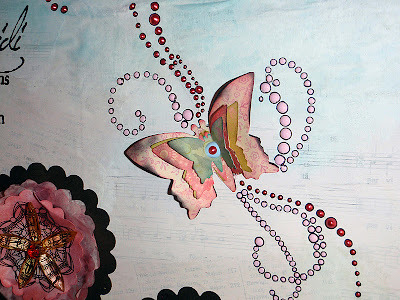 I the opposite corner of my pic I made similar cluster of flowers and leaves. 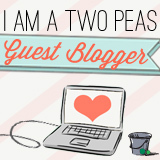 Oh did I mention that I glittered all leaves and flowers? Recently I have found myself addicted to Stickles, but I prefer to apply them with a very small brush rather that from the bottle. 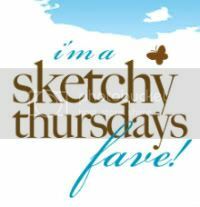 My title is just printed words in various colors and fonts - all downloaded from dafont.com. 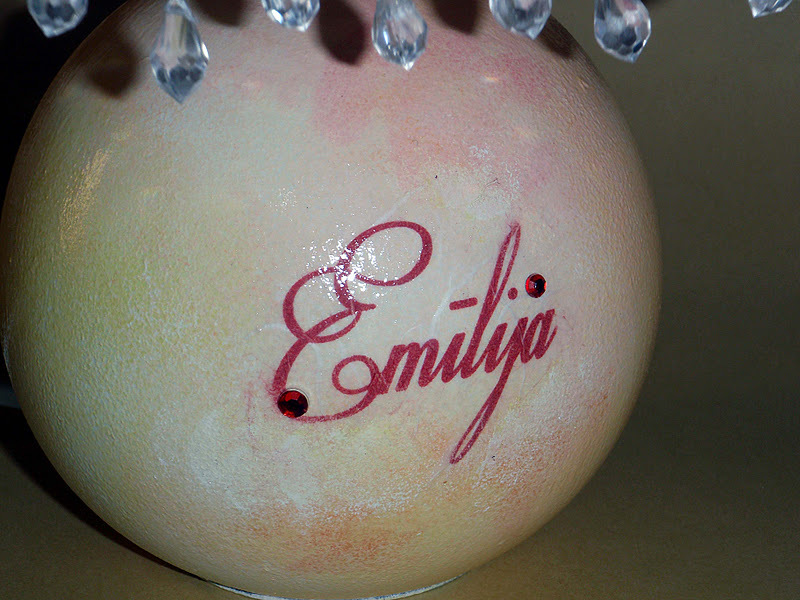 Some Glossy Accents also were applied on top of my letters. 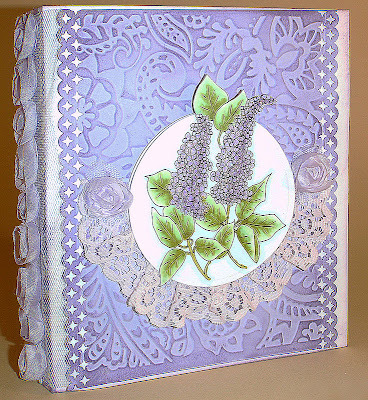 As this weeks theme over at Digi Doodle Shop's Best challenges is Lavender and lace, I went for this absolutely wonderful lilac image from their shop. Then I also wanted to try and make a book card. 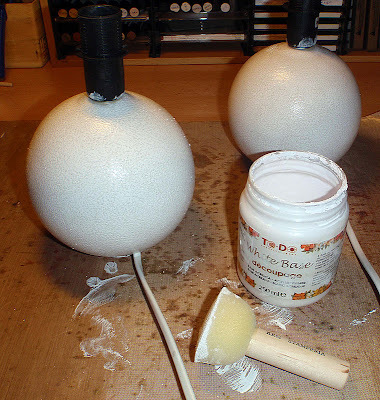 There are plenty of instructions of that online, but I used the ones in Stempeleinmaleins blog. 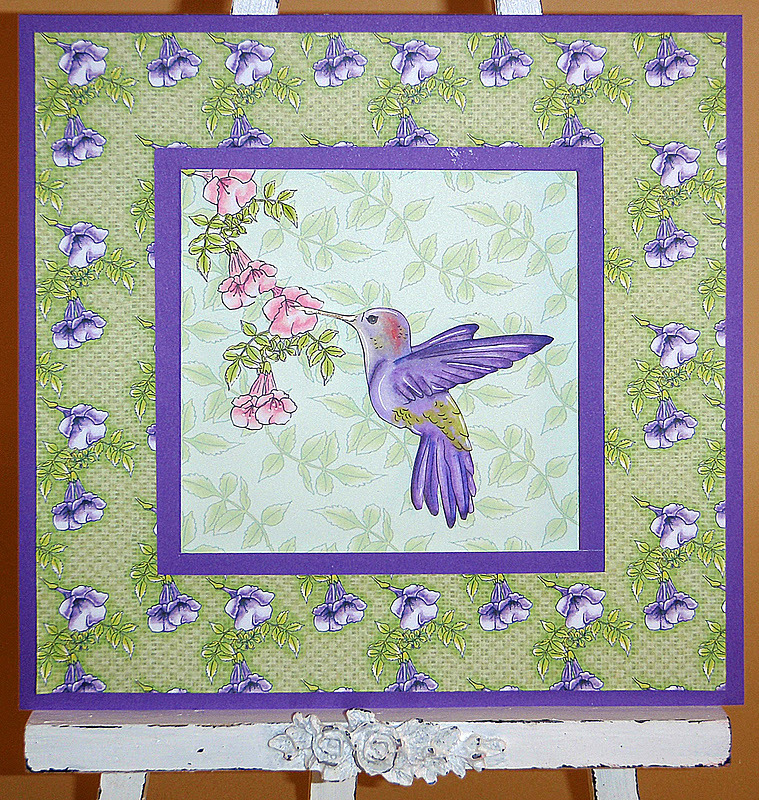 I colored this image with ProMarkers and added some Stickles over lilacs, then I die-cuted it with circle Nesties die leaving some portions of image outside the die. 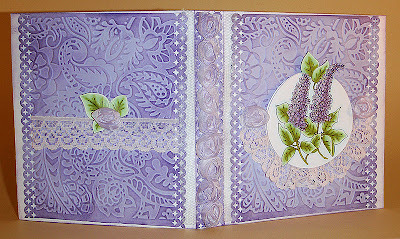 Background for this card is embossed with Sizzix embossing folder and then inked with Milled Lavender Distress Ink. 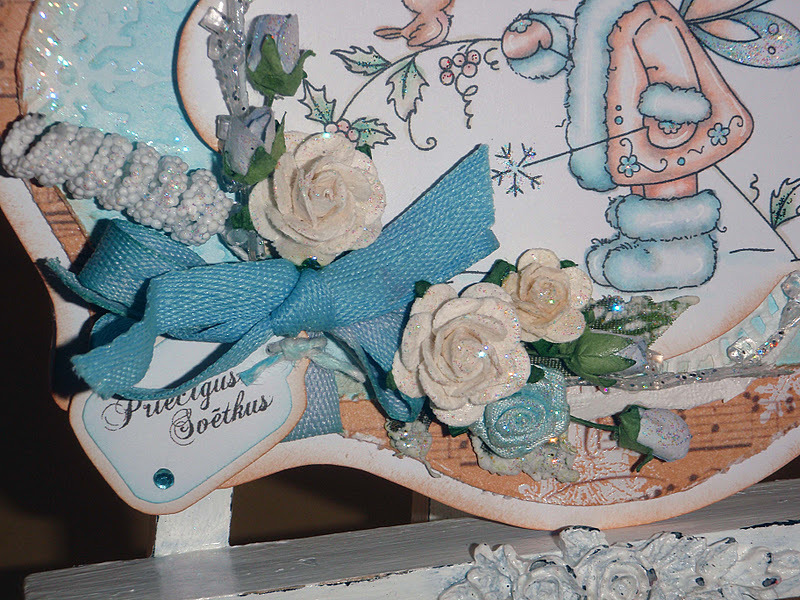 Oh and edges were punched with Woodware border punch. 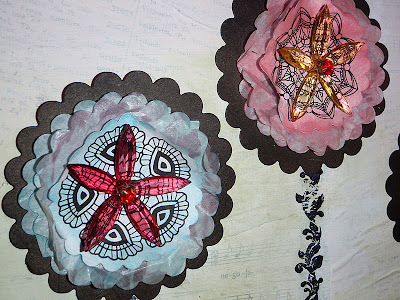 I die cut another circle and stapled that lace on the lower half of it making those ruffles. 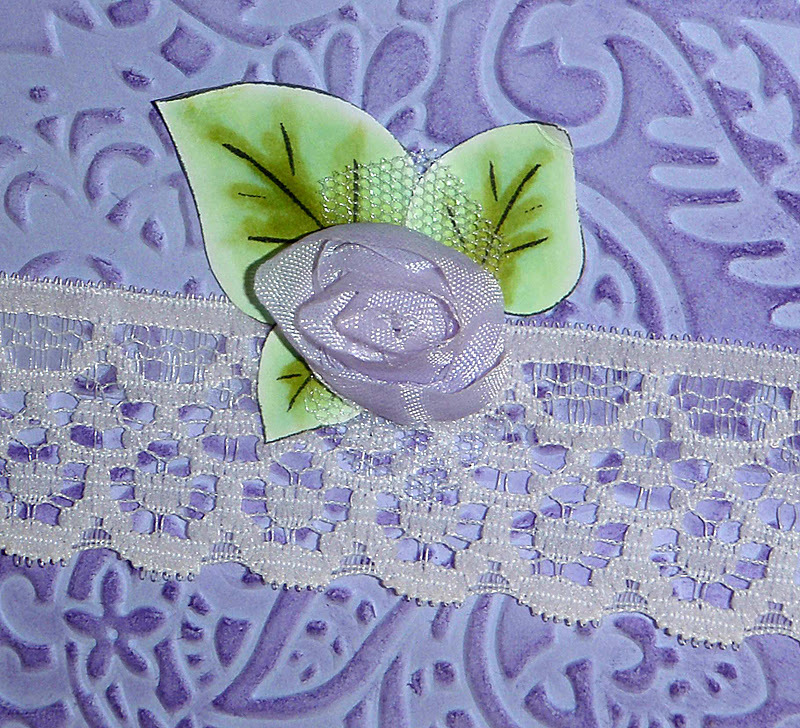 Two lacy roses were just to neatly finish the edge of lace ruffles. It was actually white lace rose ribbon, but I cut it into two separate roses and inked it with the same Distress ink and water brush. 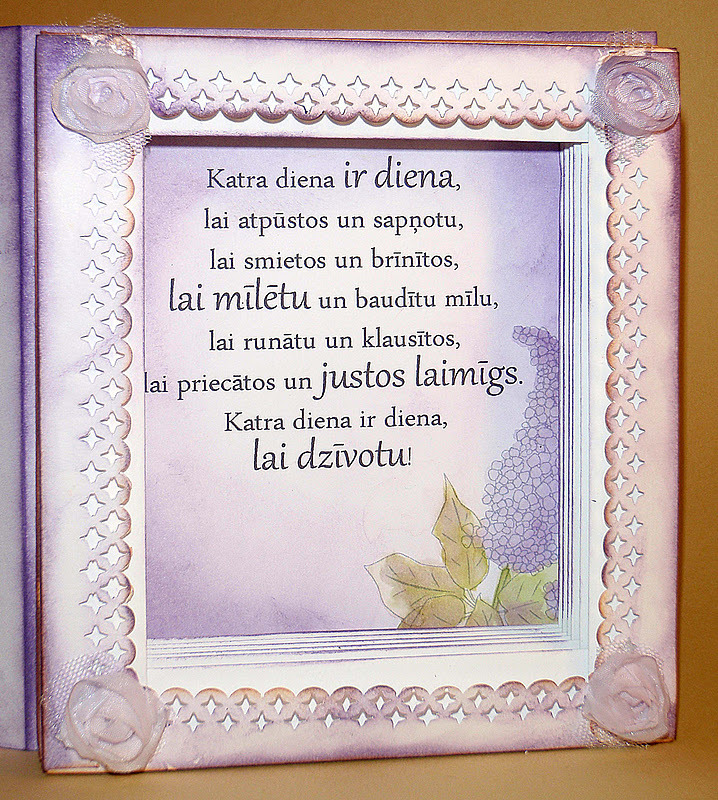 this is the card when it's open. 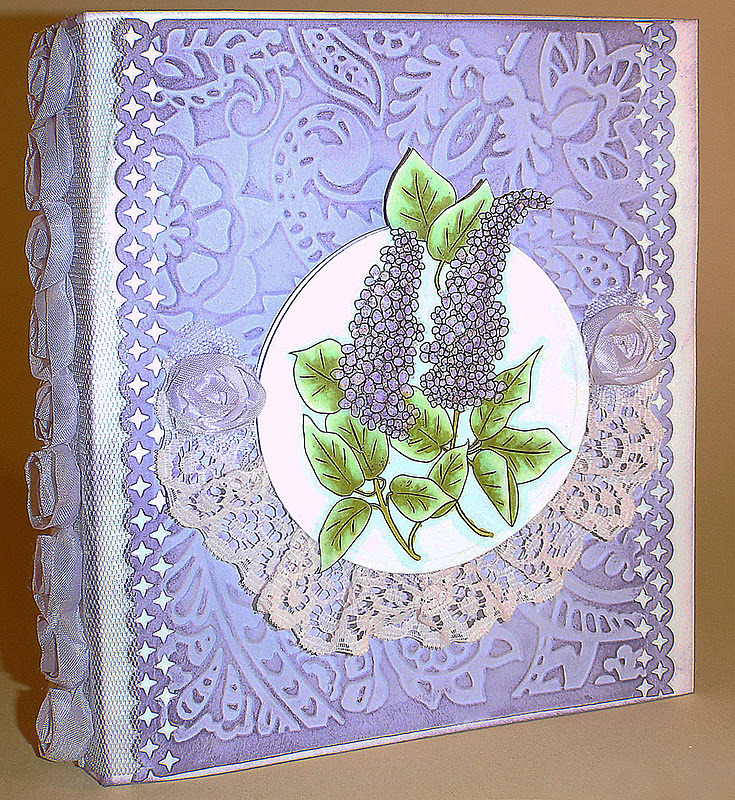 Same lacy rose ribbon goes over the spine of this book card as well. I isolated one of the leaves from the Lilacs image and printed it out in three different sizes and one is even flipped horizontally to make it appear like three completely different leaves. and the inside of card is somewhat inverse of the outside - more white and less lavender colors. 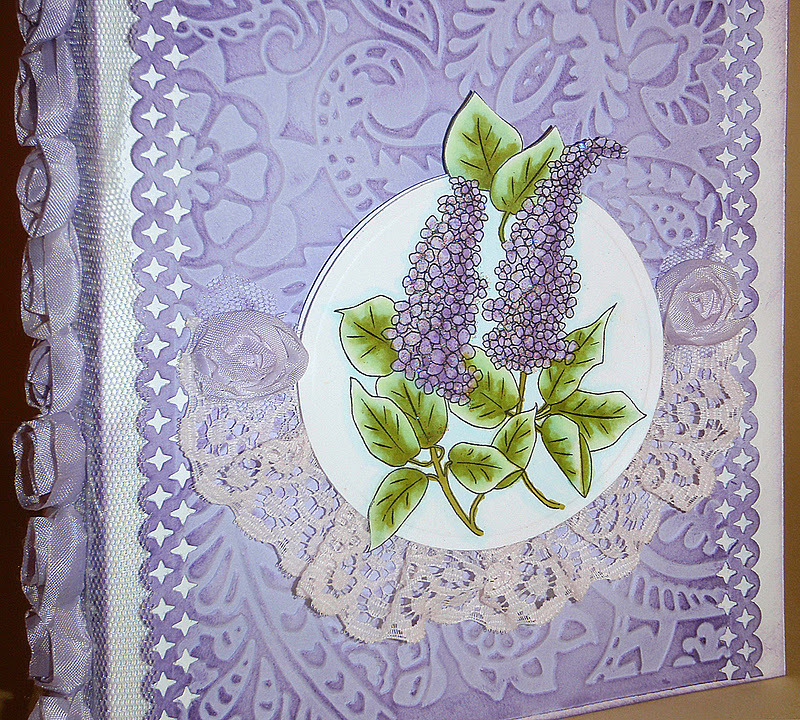 I used the same border punch and lacy roses in the inside as well. I also added part of lilac image but this time I water-colored it with Distress inks, so that it wouldn't be so bright and would not overlay my sentiment. 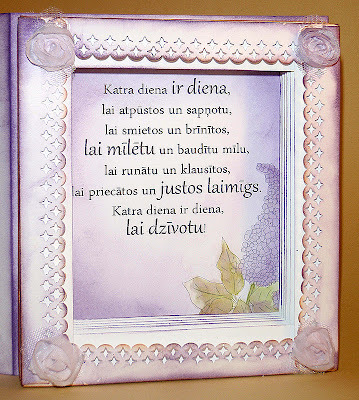 I really love this sentiment: "Every day is a day to relax and dream, to laugh and wonder, to love and feel love, to speak and to listen, lo have fun and be happy. 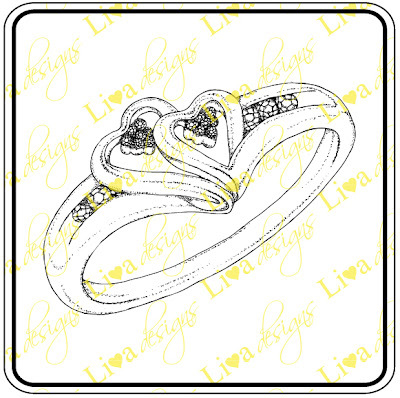 Every day is a day to live!". After I saw this beautiful creation of Mona L. Pendleton from Cupcake's Creations, I just knew that I simply must make this into a wall art for my studio! I decided to use Claudine Helmuth 12'' sticky back canvas as a base and then gessoed lots of torn phone book and note papers. 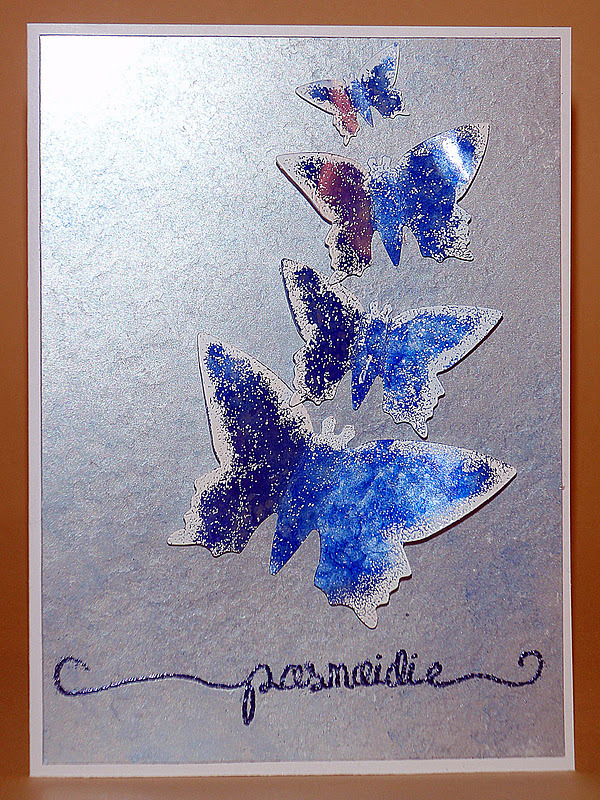 After it all dried, I inked my background with green, blue and slightly pink Distress Inks. 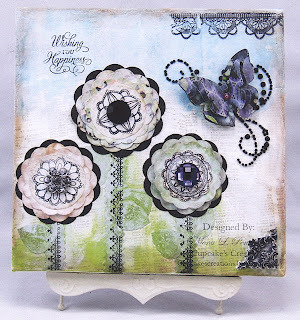 I used simple Spellbinders scalloped circle dies for my flowers - black card and tissue paper topped with free digital doily stamps on plain office paper. 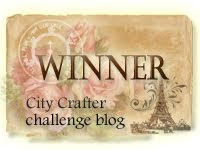 Flower centers are from artificial acrylic flowers I purchased in home decor store. I just snipped blooms apar and used them as brads as they had two wires as stems. I added this metallic flower embellishment in the corner as it has three flowers just like on the layout. I bought in in our local Abakhan some time ago. 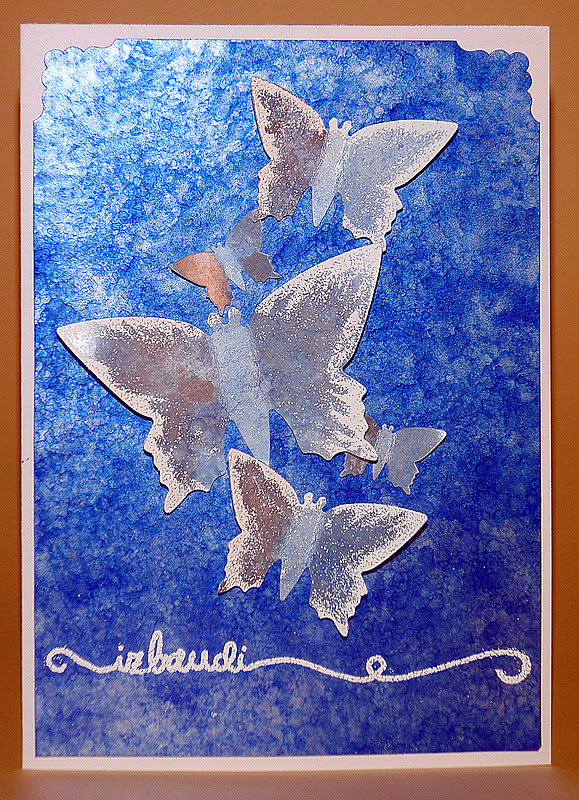 So I had this vision one might say, of butterflies fluttering on a glossy blue and silver surface joined bu white curly sentiment. and here is the outcome - three cards with alcohol inked backgrounds, punched butterflies and embossed details and sentiments. 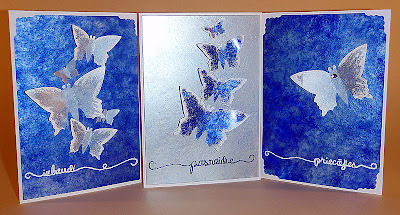 I hand-wrote sentiments with glue pen (well actually with a pencil on plain office paper at first and then transferred it to my card) and then embossed with embossing powder. 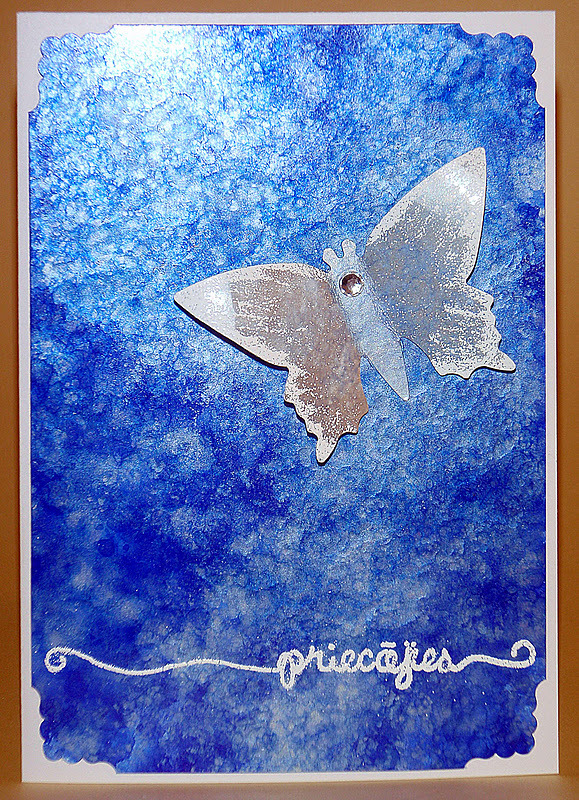 I decided that I also have to make a reverse colored card - with silvery (and also slightly blue, but you can not see that in photo) background and blue butterflies. This sentiment says "smile". this sentiment says "have fun". 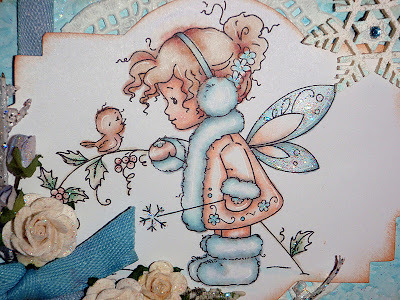 Simon Says Stamp And Show Some Things With Wings Challenge.